Here are the most frequently asked questions we receive regarding our SAP training courses. If you have a question not covered here please review our other FAQs. How does online SAP training work? All our SAP training courses are self-study, online courses available 24/7 via our website. You can study at your own pace from anywhere where you have internet access. Take a look at our demo course. All lessons include interactive, simulated SAP sessions - as if you are logged into a real SAP system. The lessons will explain each transaction and you have to interact with the screen (such as clicking on buttons, filling out fields, etc.) - just like you are logged into an SAP system. How long will I have access to the SAP training courses? All courses are valid for 1 full year. While your course subscription is active you can repeat the lessons and the final exam as many times as you want. Yes, all training courses include a Certificate of Completion - see a sample. The Certificate can be printed or downloaded from our website after you have successfully completed the course. Also, each Certificate includes a unique validation number that can be verified on our website. Is SAP Access included in the SAP training courses? No, it is not. Many of our students have access to an SAP system at work and therefore, we do not include it in the training courses. While SAP access is not required to take our training courses many students find it helps them with practice exercises. If you do not have access to an SAP system you can sign up for our SAP Access subscriptions. This will give you access to a live SAP system where you can practice what you learn in the training courses. What are the technical requirements to take the SAP training courses? Any recent computer will work just fine and you should have a high-speed internet connection. Also, you need Internet Explorer 10 or higher (or latest Firefox or Chrome browsers) and the latest Flash player. Are the SAP training courses available 24/7? Yes, they are! You can take the courses at any time from any location as many times as you like. Can I use multiple computers to access the SAP training courses? Yes, you can! You can use any computer and switch back and forth (i.e. between a work computer and a home computer) - however, you may not share your training courses with another person. Can I use an iPad to take the training courses? You can use tablet computers but you have to use a browser that supports Flash. Do the SAP training courses include audio? Yes, courses do include audio, however all instructions and explanations are in written form so you do not need the audio to take the lessons. How long are the training courses? The duration of our courses varies by topic. On average, they range between 2-6 hours. A typical training course contains about 4 - 12 separate lessons and each lesson must be completed within 30 minutes. You can take the lessons at any time and in any order. Also, you can repeat lessons as many times as you like during your subscription period. Can I print/download the training material? Yes, all of our courses include links to the online help documentation and study guides which you can print/download. What training material is included with the training courses? Most of our courses include study guides and links to the corresponding online help documentation for further study. Our study guides supplement your online learning experience and you can use them to take notes while you are going through the online lessons. What SAP release are the courses based on? We use the latest SAP releases for our courses: ECC 6.0 and BI 7.0. What SAP training courses should I take and in what order? 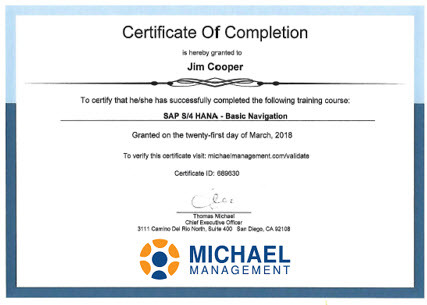 You can take any course in any order...however, we typically recommend that you start with the Basic SAP Skills curriculum, followed by end-user courses and then followed by the configuration courses. It is important to know the end-user functions before you study the configuration lessons. I am looking for a training course but can't find it on your website! Tell us about the course you are looking for! If we receive enough demand for it we'll consider developing a new course. Request a new training course here. How long does it take to activate my training course? Your courses will be activated immediately after your purchase. Do I need high-speed internet access? You do not need it but we recommend it. While it is possible to take the training via a dial-up connection, we recommend you use a high-speed connection such as DSL or Cable. Yes, we do! There is no risk for you. Simply purchase our courses and take a couple of lessons. If you are not satisfied with your training simply tell us in the first 10 days and we'll refund your purchase price for any training course you have not completed. We want you to be happy with our training courses! There are no additional or hidden fees for training courses. If you sign up for a training subscription, you are set up on a month-to-month auto-renewal after your year is up. You will be notified one month prior to the auto-renewal starting, you may opt out at that time. Also, the training course price includes all material and quiz/exams fees already. Do the courses include a quiz or exam? Most courses include quizzes at the end of each lesson and a formal final exam at the end of the course. These quizzes are designed to test your knowledge of the topic covered in the lesson. You can repeat the quizzes/exams as many times as you like. You need 80% to pass a quiz/exam. Will your courses prepare me for SAP's Certification Exams? We do not have any information about SAP's certification exams - we offer our own certification program. Our training courses prepare you for the real world where SAP is being used. How do your courses compare to other courses I have seen? Many of the so called training courses available on the internet are nothing but Word documents or PowerPoint presentations with a few SAP screen prints...obviously, not the way to learn SAP. Our courses are hands-on interactive, simulated SAP sessions - as if you were logged into a real SAP system. You have to follow the on-screen instructions and explanations, enter data into fields, click on the correct buttons, etc. - just like a real SAP system. When you compare training courses make sure to take a look at some samples/previews. Here's our demo course. Also, make sure the training courses use the latest SAP releases and functions (We do! Our courses are based on ECC 6.0). Will I be able to get a job after the training? Do you provide job placement assistance? Our training courses are designed to give you real-world SAP experience that you can use immediately in an SAP position. However, we do not provide job placement assistance or job guarantees. You might want to work with a recruiter to determine how best to take advantage of your personal situation. How do I get started? What course is right for me? If you have no prior SAP experience you should start with the Fundamental SAP Skills curriculum. The typical path is to take overview and end-user courses first. Once you have a good understanding of the end-user functionality you can move on to the configuration courses. Do you offer live training courses and do you have any training centers? No, sorry, we're a 100% online training company. Also, we do not have any training centers for public classroom training. Is the Certificate valid anywhere and can it be verified by my employer?